Kofi Atta Annan was born on the 8th April 1938 and died on the 18th August 2018. He was a Ghanaian diplomat who served as the seventh Secretary-General of the United Nations, from January 1997 to December 2006. He was the founder and chairman of the Kofi Annan Foundation, as well as chairman of The Elders, founded by Nelson Mandela. He was born in Kumasi, Ghana. Annan joined the UN in 1962, and he was appointed as the Secretary-General on 13 December 1996 by the Security Council. His twin sister Efua Atta, died in 1991. He did his undergraduate studies in economics at Macalester College in St. Paul, Minnesota, United States, in 1961. Annan then completed a diplôme d'études approfondies DEA degree in International Relations at The Graduate Institute of International and Development Studies in Geneva, Switzerland, from 1961–62. At the MIT Sloan School of Management (1971–72) he earned a master's degree in management. Annan was fluent in English, French, Akan, some Kru languages and other African languages. Annan attended a Methodist school when he was younger and was known to attend several different Christian Churches as an adult. 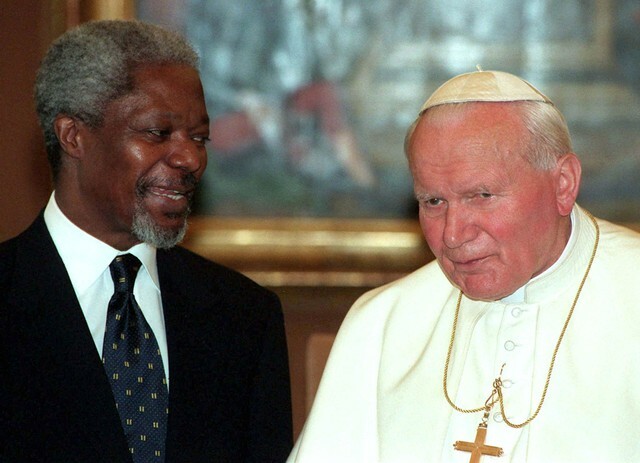 In 2001, the Nobel Committee divided the Peace Prize between the UN and Annan. They were awarded the Peace Prize "for their work for a better organized and more peaceful world." In 1965, Kofi Annan married Titi Alakija, a Nigerian woman. They had a daughter, Ama, and later a son, Kojo. The couple divorced in 1983. In 1984, Annan married Nane Annan a Swedish lawyer at the UN. She has a daughter, Nina, from a previous marriage. Annan died on the morning of 18 August 2018 in Bern, Switzerland, at the age of 80 after a short illness.